Is Your Voice Telling on You? Meditation has been practiced since ancient times. For thousands of years, people have experienced the physical, mental and spiritual benefits of meditation. Many scientific studies have proven that meditation enhances brain function, lowers blood pressure and heart rate, reduces anxiety and improves our overall health. The power of the mind to influence the body is quite remarkable. Meditation is a discipline for your mind, just like walking or swimming are exercises for your body. Guided meditation is an intentional, focused meditation technique that is very useful for achieving a specific purpose, such as deep relaxation, behavior change, or releasing negative emotions and self-limiting beliefs. The primary difference between guided meditation and other forms of meditation is that, instead of working to clear your mind, guided meditation allows the subconscious mind to follow the words and visualizations provided. Guided meditation methods vary depending on the changes you are looking to achieve. Sometimes a single guided meditation session is all you need to achieve deep relaxation. Other times an entire guided meditation retreat is needed in order to release negative emotions and self-limiting beliefs. If your goal is some kind of behavioral change, guided meditation should be a part of your regular routine. Guided visualization is a perfect complement to meditation because it makes good use of one of the most power senses we have–our visual sense. Guided imagery is a gentle but powerful technique that focuses and directs your imagination. It is widely used by athletes with good success. Health care practitioners have used it so that patients might imagine thousands of loyal immune system cells destroying or wiping out unsuspecting cancer cells. When properly organized, guided imagery has the built-in capacity to deliver multiple layers of complex, encoded messages by way of simple images. You could think of it as a depth charge dropped beneath the surface of the “bodymind,” where it can reverberate again and again. Feminize Your Voice Automatically with Guided Meditation & Visualization. The deep relaxation portion of this meditation program guides you into a deep state of relaxation in order to set the stage for the Kinesthetic Anchoring techniques in part two of this program. As you move your awareness through your body you are guided step by step to be aware of your breath, to focus on muscle groups and to deepen into relaxation. This guided meditation is also useful if ever you’re feeling anxious, or tense, or experiencing a stressful day. Kinesthetic anchors are physical stimulations that, through the power of visualization, connect to the very essence of who you really are. A kinesthetic anchor is something physical you do that is not a part of your daily routines or habits. An anchor is something that you can feel in a noticeable and pronounced way. When you then trigger the anchors–which you’ll develop with this program–while going about your day, your mind and body will re-create the same essence within you to the degree to which you have established that anchor through repetition of the exercises. This entire process can be confusing at first, but after working with the program for a little bit, you’ll completely understand this secret and make good use of it every day. To establish the anchors, you need to really “charge up” before the essence (of the anchor) is “stored.” Visualization techniques help to establish these anchors. Master your voice feminization techniques and finally have the voice you’ve dreamed you could have. The problem is that most transgender women try to feminize their voices by only focusing on the physical aspect of the voice. While this makes good sense and it does work for many people, it doesn’t take many people far enough. So, if you’re still reading this, it’s because you haven’t found your feminine voice! There is another way to feminize your voice. A woman’s voice is more than just posture, breathing and pitch. Her VOICE is controlled by her MIND. And YOUR mind has been programmed to be the exact opposite of a female mind! You probably aren’t even aware of all the masculine habits you picked up along the way to becoming that person you had once been, or that person who you occasionally put in the closet. The good news is that it is possible to reprogram your mind to encompass all the lovely feminine essence of who you truly are. Actually, your MIND is probably the most powerful feminizing tool you have! That’s because your mind controls your body, your behavior AND YOUR VOICE. Rather than struggling to “act” more feminine–as if you had been doing it for your entire life– wouldn’t it be great if you could JUST BE HER. By letting the essence of your feminine heart and soul rise to the surface of your consciousness, you will set the proper conditions so your FEMININE VOICE finds her way to you. And wouldn’t it be great if you could let go of all those mental blocks, conditioned responses and inner challenges that are preventing you from finding your true feminine voice? 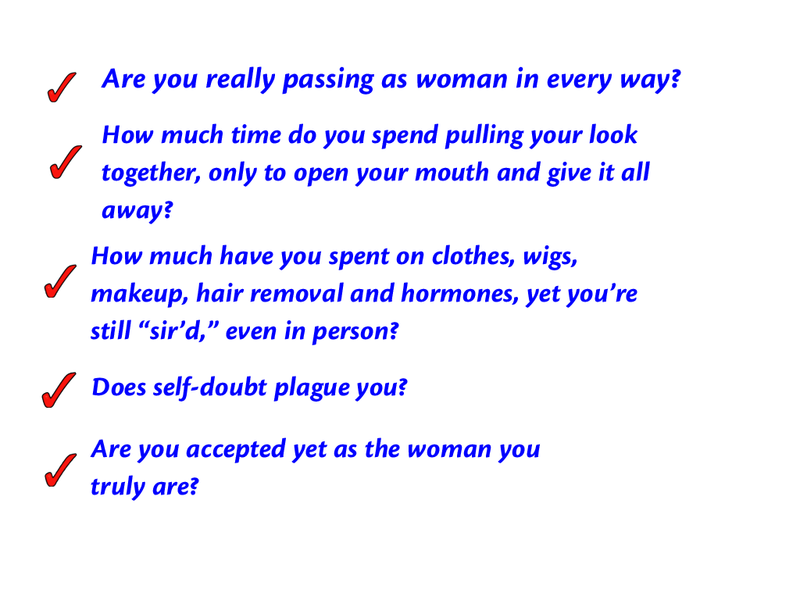 Wouldn’t it be lovely to have total confidence in yourself as a woman? VISUALIZATION is a powerful secret tool we’ve discovered for unlocking your feminine voice. That, combined with the Kinesthetic Anchoring techniques, becomes the most effective approach you can possibly have to finally achieving impressive results–your beautiful feminine voice. Meditation is a state of focused relaxation that allows you to get in touch with your subconscious mind. Your subconscious mind is the deepest part of your mind that controls your self-image, beliefs, habits, behaviors and unconscious bodily functions (like your breathing, digestion and heart rate). Think of it as the operating system for your mind and body. Through guided meditation, you can reprogram your subconscious mind and even control some of your unconscious movement patterns. Experience Total feminEssence of Your Mind and Voice. 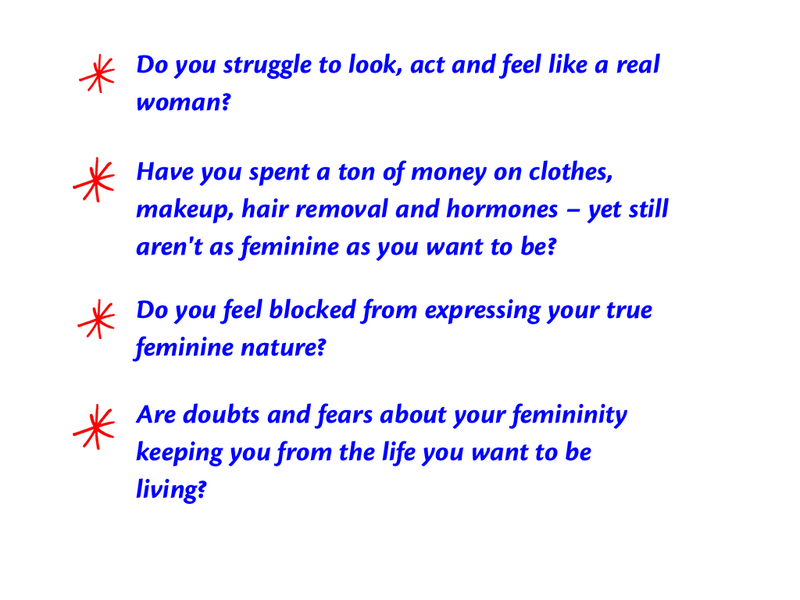 We are so excited about this new approach for feminizing your voice through the use of these powerful techniques, that we just KNEW we had to bring this resource to the transgender community. That’s why we teamed up together. Amadhia is an unbelievably talented and gifted artist. Her own story is itself an incredible testimonial to the power of this approach. Amadhia is an artist who had enjoyed good success in her industry. Slowly, as the years went along, she began to lose her edge and wasn’t producing the kind of work she knew she could. Then she hit a real block, a solid wall, and she feared her creativity would never flow freely again. She finally sought the help of a guided meditation practitioner and she began exploring the kinesthetic anchoring method. Her successes skyrocketed. She won a huge award for a project she was the lead artist on, and when people found out her secret that sparked this enormous shift, she was asked to teach guided meditation workshops to struggling artists in the US and Europe. Kathe, as a certified speech-language pathologist, had been providing voice therapy to patients with damaged voices for years. She began working with transgender people quite serendipitously when, in January 2000, the telephone rang in her small Boulder, Colorado office. The person on the other end of the line said she was responding to Kathe’s Yellow Page ad (yes, the good old-fashioned phone book). She identified herself as a transsexual woman and said she saw that Kathe was a voice therapist. Joanne, was her name, then asked if Kathe had had any experience working with transsexuals. That conversation began a shift in Kathe’s career path that led to her international reputation for providing quality voice feminization services and products. Kathe has systematized the daunting task of feminizing the voice. She has helped thousands gain confidence in the way they speak. feminEssence: A Guided Meditation for Your Feminine Voice. 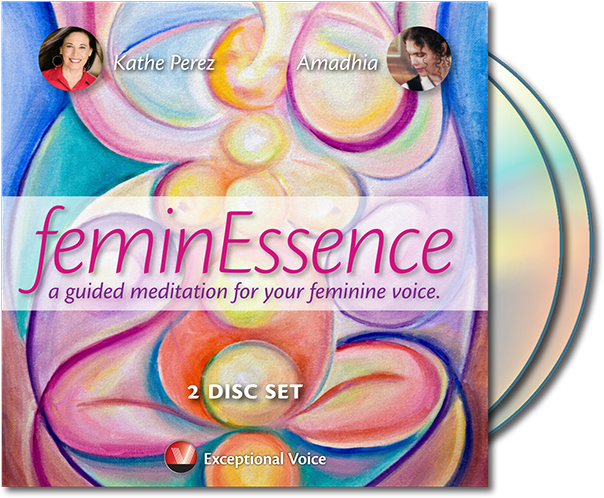 feminEssence: A Guided Meditation for Your Feminine Voice is a complete guided meditation and visualization program designed to feminize your voice and allow you to speak from the pure essence of your feminine heart and soul. It consists of five complete downloadable sessions and a detailed User Guide to help you to maximize your results. The 18-minute “Relaxation Journey” is designed to take you on a journey into your mind to unlock the hidden gems that will help facilitate your acquiring your truly feminine voice. The 35-minute “Visualization Journey” will guide you on a journey into your imagination to help you connect with your breathing, posture, resonance and your spoken expression. This visualization experience leads you toward the kinesthetic anchoring techniques in the following three sessions. The exercises in part 2 are much more active and much more “work oriented,” as we anchor your visualization skills more effectively. Express the joyful essence of the woman you really are. Instantly trigger your feminine voice every time your speak. Activate your anchors to channel the feeling of your feminine voice. Be at perfect peace and ease that you are expressing yourself as the beautiful woman you are. Bring your imagination and your actual feminine voice into alignment. Sit back, relax, and allow us to gently guide you toward unleashing your femine essence. Note: The actual program consists of the equivalent of two audio “discs” (two hours of material) and a User Guide. There are no videos in this program. Click on the “buy now” button below. As soon as you’ve placed your order on our secure server, you will be automatically redirected to the download page where you can download all five voice feminization guided meditation sessions (two hours of material) in MP3 format + the User Guide IMMEDIATELY. The MP3 files can be played on an iPod, computer media player or any MP3 player. A 60-Day, No Risk, Unconditional 100% Money-Back Guarantee! We are so confident that our “feminEssence: A Guided Meditation for Your Feminine Voice” program will meet your expectations, that we are backing it with a 100% guarantee. Test the program RISK-FREE for 60 days. 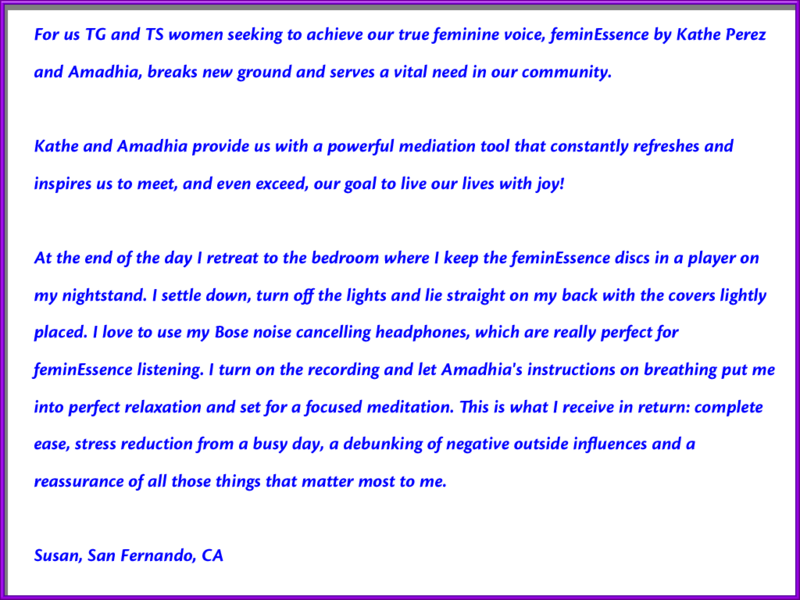 If you are not completely satisfied, just let us know and we will send you a prompt and courteous, no hassles, no hesitation, 100% refund. So are you ready? We know you are going to enjoy this program as much as we enjoyed creating it … and we’re confident that you will be amazed at your results! Order NOW and let’s get started! P.S. Remember, with our 100% program satisfaction guarantee, there is no risk on your part. You have nothing to lose by giving feminEssence: A Guided Meditation for Your Feminine Voice a try! 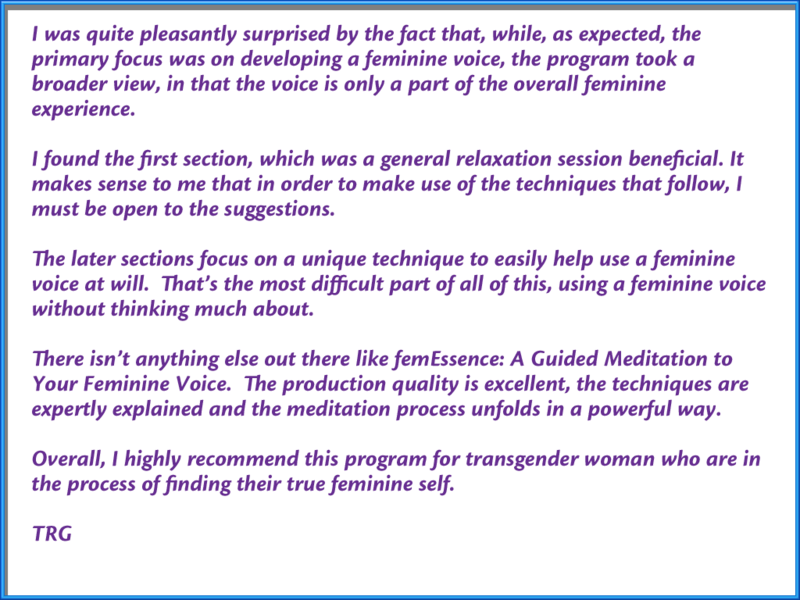 NOTE: feminEssence: A Guided Meditation for Your Feminine Voice consists of a series downloadable MP3 audio files and PDF User’s Guide. No physical products will be shipped. After you order, you will get INSTANT ACCESS to download the MP3s, which can be played on your smartphone, iPad, tablet, iPod, computer media player or any MP3 player. Copyright 2016 Exceptional Voice, Inc. All rights reserved.